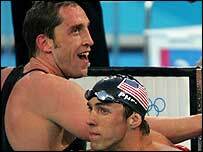 Stephen Parry dug deep to win Britain's first Olympic swimming medal for eight years in the men's 200m butterfly. The 27-year-old broke the Commonwealth record to take bronze, while Michael Phelps won his second Athens gold. Phelps shrugged off the disappointment of losing to Ian Thorpe in the 200m freestyle by setting a new Olympic mark of one minute 54.04 seconds. Japan's Takashi Yamamoto surged past Parry in the last 25m of a gripping final to clinch the silver medal. "It's amazing - we really needed a medal in the British camp," said Parry, who added that he was not completely satisfied despite his time of 1:55.52. "This is just brilliant - it's what the Games are all about. I have spent my whole life wanting to get a medal at the Olympics. "I am not satisfied because I didn't win even if I lost to the best in the world. "But I am just excited that Britain has won a medal. We have so many quality swimmers to come and hopefully I can start the ball rolling." Parry, who finished sixth in the Olympic final four years ago and fourth in the 2003 world championships, also paid special tribute to his father, who had been too ill to travel to Athens. "I feel for my Dad who couldn't come out to watch me. So I am really pleased to be coming home with a medal." Until Parry's bronze, Britain had suffered a series of disappointments in the pool. James Gibson and Darren Mew had been the best hopes of a medal - but could only finish sixth and seventh respectively in the final of the men's 100m breaststroke. And Melanie Marshall failed to even make the women's 200m freestyle final - then had to watch as the gold medal was won in half a second slower than her personal best. Performance director Bill Sweetenham had insisted publicly before the Games that just two medals would be a decent return as Britain sought to rebuild after Sydney, where they left without a podium finish. But the feeling from those close to the team was that five medals was their target. Katy Sexton, 200m backstroke world champion, 1500m freestyler David Davies and Rebecca Cooke (800m freestyle) are among those still to come.